"Leaving the unclean world means to abhor and to depart from this impure world. It means to depart not only from this human world but also from the entire six realms. These all taken together constitute what is called the Three Worlds. There is no peace in the Three Realms. The Buddha explained them by comparing them with a burning house and by saying that it is like living in a house which is on fire. It is a thing above all others from which to separate oneself with a feeling of disgust". "Truly this world is a prison-house and the Pure Land is our true country. We should therefore make haste to dislike and escape from this prison-house and turn to our true country of the Pure Land". As death comes to each one of us, we'll certainly die one day, due to the exhaustion of our karma which provided us with the present human life, and if we haven't yet entrusted ourselves to Amida Buddha, we'll be reborn in one of the samsaric realms impelled by the power of our karma. 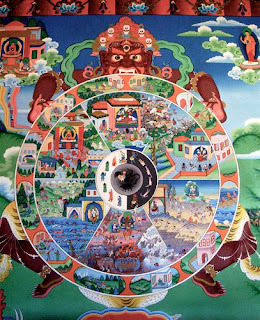 So please, contemplate the suffering inherent to all the six realms, and try to imagine yourself there, because you''ll surely remain in samsara if you do not accept Amida's helping hand. 3) in terms of the type of birth, they are reborn in four ways, from the womb, like human beings, some animals and devas (gods) inhabiting the earth, from the egg, like birds and fishes, from heat and moisture, like some insects and worms, and by spontaneous birth, such as gods, pretas (hungry spirits) and hell-dwellers.